The cow as a principal subject of painting may seem an odd choice. But Montreal artist, Eloise Brodeur, has elevated the bovine creature to a sort of muse. By painting images of her cows against a stark background of a single color, Brodeur suggests to her viewers that there is communion to be had between creatures and people and that perspective should cause us to reflect on our individual and collective lives. From my own experience, cows seem to be naturally curious creatures, even if they are often skittish around strangers. Brodeur seems to capture that sense of curiosity and sensitive feeling in her images. More of Brodeur’s intriguing work can bee seen on her artist site or at the site for Galerie Got Montreal, which represents her work. Richard Ahnert’s anthropomorphic art is both whimsical and brilliantly provocative. This Toronto-based artist paints intriguing images of animals engaged in activities one might expect of weary modern-day city dwellers. While his work harkens back to the playful (and disturbing) posed taxidermy of the Victorian era, Ahnert’s paintings engage the viewer with considerable satire and reflection. 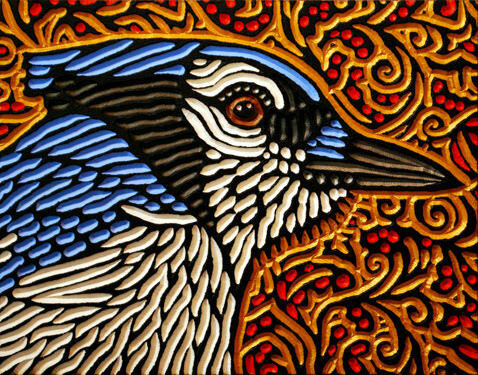 The images here provide only a small glimpse of his range and more of Ahnert’s fascinating paintings can be seen at his website, MyCanvas.ca: Paintings by Richard Ahnert. 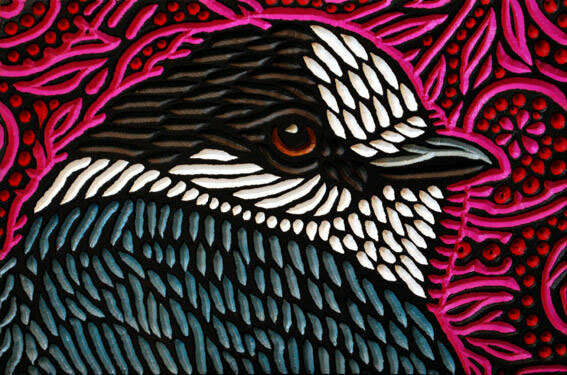 Lisa Brawn is a Calgary-based artist who painstakingly creates exquisitely vibrant woodcuts. 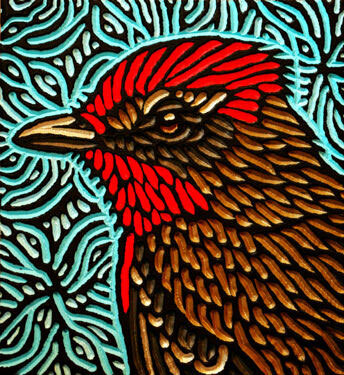 Her subject matter ranges from wild animals to celebrities to pop culture icons. 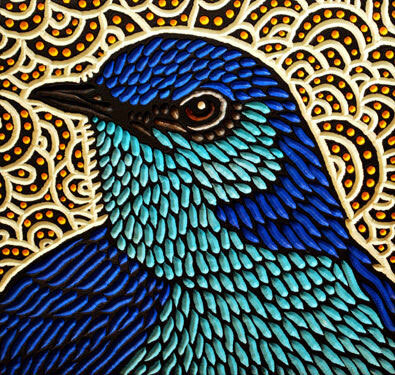 Shown here are some of her amazing images of wild birds, each with an abstract background carving that nicely complements the main subject. 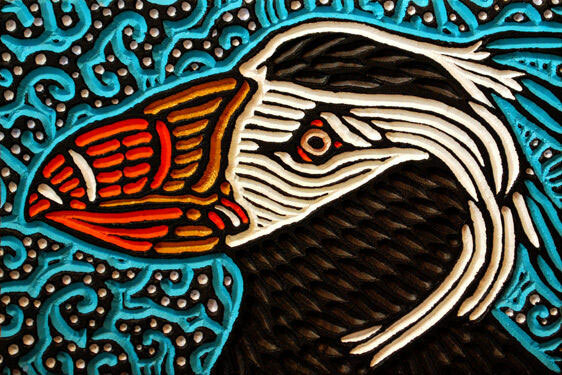 Brawn’s annual “Wild Bird Woodcuts” wall calendar is gorgeous and is a hot collector’s item, having quickly sold out its 2014 and 2015 print runs. More of her fabulous art can be seen at her website here.